The beauty of a tree's leaves turning from lush shades of green into a carpet of fiery reds, purples, oranges and yellows is a sight to behold in a garden. Not all trees turn their leaves to red as the summer season ends. Some trees keep red leaves all year through. If a red-leafed tree is a favored garden find for you, there are a few from which to choose depending on your interests and needs. A deciduous tree's leaves turn red when the weather begins to get cooler because that type of tree does not produce the correct amount of chlorophyll to keep the bushy leaves their vibrant color all year long. It's not the tree's fault. As the days grow shorter and the sun doesn't shine as long on the trees, they produce less chlorophyll. The pigments, or anthocyanins, within the leaves then change their shades, fading from green to a wide variety of deep-hued fall colors. Each variety of fall-color tree has a different shade of red, from a rustic burgundy to a pale purple or fiery orange. This contrast against otherwise green trees, grasses, mountains or city backdrops is a striking seasonal event. There are a number of trees to choose from that will produce a lovely autumnal show of color. Whether you want a cascade of reds or a rainbow of fall colors ranging from greens to yellows and reds to oranges, there is a large variety of choices in fall-color trees from which to choose to achieve that scenery. 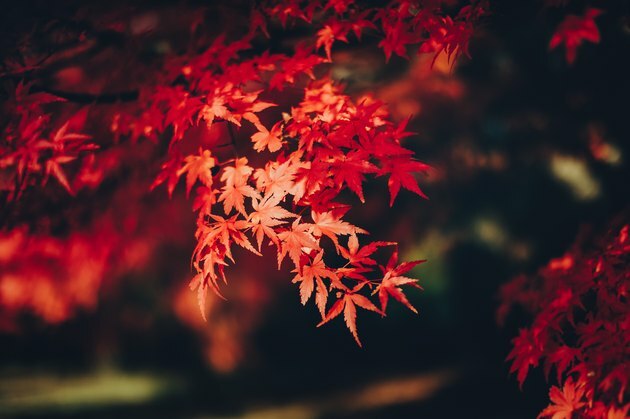 However, if you don't want a tree that only turns red at certain times of the year, there are alternatives to getting that pop of red in your garden or landscape all year round. A fiery tree with pops of red or hues of maroon that wave in the wind can be a surprise in a treat of color in the summer garden. These types of trees that have red leaves during the hottest months of the year include the ornamental red-leafed Japanese maple, which has clusters of pointy leaves with seven tips, and the red-leaf plum tree, with pinkish-red leaves in the spring that turn a rugged purplish-red hue in the fall. The southern sugar maple has reddish orange leaves in a traditional five-point leaf shape. The fireglow upright red Japanese maple tree has a graceful trunk and wide canopy of red leaves that make a lovely summer show. Autumn trees add a lovely spot of rich color to the landscape when the temperatures begin to dip. Bald cypress turns its towering trunk into a cascade of orange- and red-colored leaves in autumn. The sugar maple runs through the rainbow of fall leaf colors, from vibrant shades of light green to yellow, orange and a blazing red as fall ebbs into winter. The red maple with dark red leaves is a classic autumn tree with leaves of deep auburn, burnt orange or golden yellow. It holds onto its red leaves throughout the year. 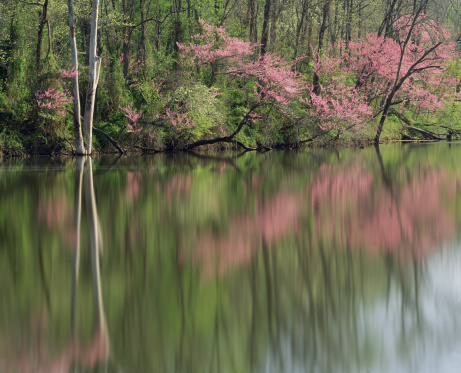 The black tupelo will have a feast of color on one branch, ranging from scarlet to orange, yellow, deep purple and a vibrant red. The thick green leaves of the sourwood burst into a colorful show of yellows, purples and bright reds as the colder season begins. The autumn blaze maple tree is a beauty, towering over surrounding green trees to shower the landscape with bursts of red, yellow and orange leaves. What Trees Have Red Leaves? Which Trees Have Red Leaves in the Fall?